I know that "Caprese" was one of my first posts, but I thought that I would include it here again because it was part of the dinner party, in accompaniment to the Pesto Rigatoni. This dish is one the easiest I will post, but there is a catch. The trick is the ingredients need to be fresh and of the utmost quality. The only reason it is easy is because the ingredients are so flavorful and don't need any help shining through. This dish is best prepared after returning from a local Farmer's Market where you can purchase fresh and organic tomatoes, basil, buffalo mozzarella, and maybe even olive oil and balsamic vinegar. You can try to go to the grocery store but it is not advised. I don't really follow a strict recipe for this dish, but it comes out tasty every time. But, here are some guidelines that I generally follow each time I make it. 1. Prepare the tomatoes by slicing them in hearty slices. Lightly salt the tomatoes. Then slice your mozzarella to the same size. 2. 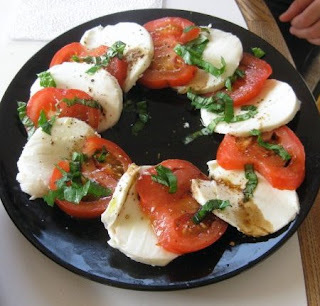 Arrange on a large plate, overlapping tomatoes and mozzarella. 3. Gather basil leaves. Tightly roll up the leaves, until the roll is about the width of a pencil. Then slice the roll in small (1 centimeter) slices apart. Then unravel the slices. They should come out like strips. It's a cool tip for cutting herbs if it works. 4. Douse plate with olive oil, some balsamic, and then some pepper. 5. Top with basil strips. Serve with red wine (Chianti is best) and some toasted bread. Thanks to my good friend and blogger, Max Gibson, and his good taste, for featuring a part of this post in his blog, Wines & Bowties. Thanks for the publicity, Max!